A United States Air Force Minotaur 1 rocket from NASA's Wallops Flight Facility in Wallops Island, Va., on Nov. 19, 2013. The rocket deployed 29 small satellites, including Hoʻoponopono 2 built by University of Hawai'i at Manoa engineering students. 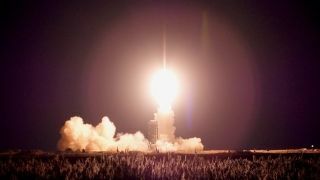 A spectacular rocket launch from Virginia's eastern shore late Tuesday (Nov. 19) lit up the night sky like an artifical sun, kicking off a record-breaking mission to put 29 satellites into orbit. The Orbital Sciences-built Minotaur 1 rocket launched into space at 8:15 p.m. EST (0115 GMT Wednesday) from NASA's Wallops Flight Faciltiy in Virginia to begin the ORS-3 mission, which is run by the U.S. military's Operationally Responsive Space Office. The launch was expected to be visible to millions of observes along the U.S. East Coast, weather permitting. A Minotaur 1 rocket rises into the Virginia sky on Nov. 19, 2013, carrying a record-breaking 29 satellites to orbit on the ORS-3 mission. The rocket toted a total of 29 satellites — the most ever delivered to orbit in a single launch, mission officials said. A so-called "PhoneSat" built by NASA and the first-ever satellite designed and built by high school students were among the spacecraft hitching a ride into orbit on the four-stage Minotaur 1 rocket. ORS-3's primary payload was the U.S. Air Force's $55 million STPSat-3, which carries five separate experiments and sensors that will measure various aspects of the space environment. STPSat-3 is the second spacecraft launched under the military's Standard Interface Vehicle program, which aims to help reduce the cost and preparation time of key satellite missions. "We continuously search for affordable launch options, including rideshare opportunities on government and commercial missions," Col. Todd Krueger, director of the Defense Department's Space Test Program, told reporters during a pre-launch press conference on Nov. 14. PhoneSat 1.0 (right) and PhoneSat 2.4 both use commercially available smartphones as the brains of the satellites. Photo uploaded Nov. 18, 2013. "The ORS-3 mission is a critical opportunity for the Space Test Program to conduct more space R&D," Krueger added. "The projects that we're flying on ORS-3 will benefit tomorrow's national security space architecture by studying the space environment and providing advanced capabilities for the warfighter." NASA's Ames Research Center in Moffett Field, Calif., provided PhoneSat 2.4, the next step in the space agency's efforts to demonstrate the utility of cheap spacecraft based on off-the-shelf commercial smartphones. Asha Punnoose beams next to TJ3Sat, a the first CubeSat to be built by high school students and launched into space through NASA's ELaNA program. NASA also contributed Firefly, a cubesat that will study lightning flashes around the globe. "Firefly will gather up to a year of observations on the mysterious workings of lightning," Firefly principal investigator Doug Rowland, of NASA's Goddard Space Flight Center in Greenbelt, Md., said in a statement. "Lightning is so familiar we tend to take it for granted, but we really don’t know the details of how it works — even though it is a critical part of the global electric circuit, and has obvious social and technological effects." An artist's rendition of the football-sized Firefly satellite in low-Earth orbit. Firefly's mission is to study the relationship between lightning and huge bursts of gamma rays called terrestrial gamma ray flashes. It is scheduled to launch on Nov. 19, 2013, with 27 other CubeSat missions on the Orbital Sciences ORS-3 mission, lifting off from Wallops Island, VA.
To learn more about the satellites that launched today, check out this list provided by the Operationally Responsive Space Office. In addition to the 29 satellites launched aboard the Minotaur 1 rocket, three other cubesats were deployed in orbit on Tuesday. Those three tiny satellites were launched from the Kibo Japanese laboratory on the International Space Station, NASA officials said. That brings the total number of cubesats launched on Tuesday up to 31 satellites, not including the larger STPSat-3. A fourth cubesat is due to be deployed from the International Space Station on Wednesday (Nov. 20). Editor's note: If you snap an amazing photo of Tuesday night's launch, or any other night sky view, and you'd like to share it for a possible story or image gallery, please send images and comments to managing editor Tariq Malik at spacephotos@space.com.